An EMT continued testifying after a recess, stating all of the emergency workers at Michael Jackson's house knew the singer was dead, but Dr. Murray wouldn't "call it. " 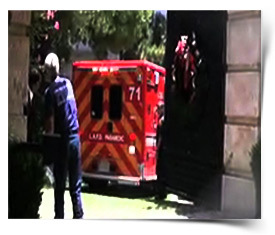 Richard Senneff testified about facts that TMZ has been reporting for more than a year -- that when paramedics arrived at MJ's house, there was no sign of life and no chance of revival. Nevertheless, Senneff testified Dr. Murray claimed to feel a pulse and, as the senior medical person on scene, refused to pronounce MJ dead. Murray ordered the EMTs to take MJ to the hospital. Senneff said the ride was "unbelievable ... like the Rose Parade. People running down the street, taking pictures, random cars passing the ambulance. It was insane." Once at UCLA, Senneff said Murray was "spinning ... moving around, nervous, sweating, multitasking." On cross examination, Ed Chernoff got Senneff to admit ... Jackson's skeletal, frail frame, along with his black/bluish feet, were signs of a drug addict.